Although much of our media seem to consist of a never-ending babble of gloom and doom, a significant number of people are seeking a new way to find joy amid the pessimism. Activate Joy offers a powerful and delightful series of practical methods designed to make your journey to joy easy and fulfilling. 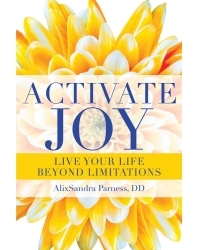 An ordained minister, doctor of divinity, and trained clairvoyant in a wide variety of healing and energetic modalities, AlixSandra Parness uses her brilliant tools to create new strategies to lead us into the heart of joy. With fresh and original ideas, exercises and techniques, Activate Joy will carry you through an ascending spiral up and into the spirit of joy. It is the single resource you need to learn how to live your life beyond limitations. AlixSandra Parness, DD is a dedicated teacher and clairvoyant healer. She is the founder of the Inner Focus Church and the Inner Focus School for Soul Directed Advanced Energy Healing, an international vehicle for attaining enlightenment and world peace. As a teacher of teachers, she has trained thousands of students in her extensive workshops and healing school, many of whom have their own expanding networks and now touch thousands more. A dynamic and unforgettable presence, she teaches through seminars, teleconferences, and special classes. She is also a keynote speaker at venues across the United States and Canada. She resides in Las Vegas, Nevada.